Ink recipes for postage stamps were often kept secret to guard against fraud. And philatelists, having no access to such information, can rarely go further than ascribing catalogued shades by eye. But this is where physics can help. Zap the stamp with a laser and abracadabra, you know what molecules it’s made of. Photons from the laser are scattered when they hit the molecules. Most of the photons show no change in energy, but a small number of them transfer some of their energy to the molecules or vice versa. The quantity of energy transferred depends on the chemical bonds present. This effect was named after Indian physicist Chandrasekhara Venkata Raman, who first reported it in 1928 together with fellow physicist Kariamanickam Srinivasa Krishnan. One of the strengths of Raman spectroscopy compared with other spectroscopic methods is its ability to identify specific chemical compounds rather than just the elements that make them up (Clark 2005). 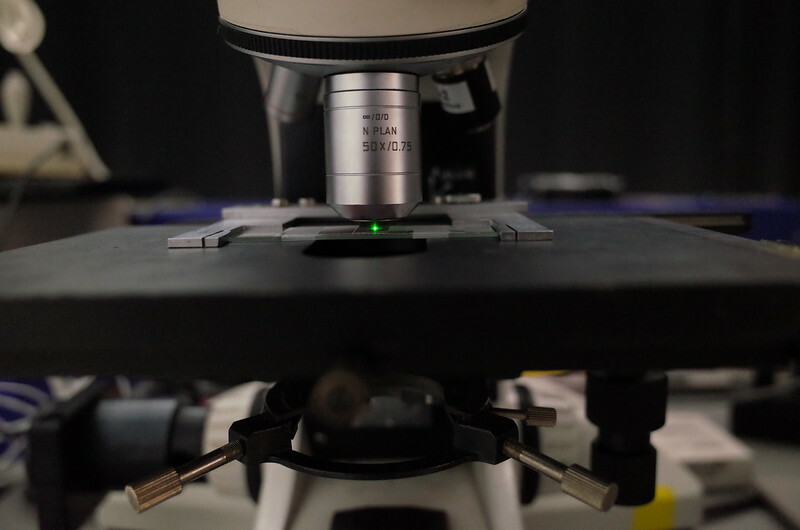 By focusing the laser through the microscope, it also enables the investigation of a very small area of interest without contamination from surrounding material. Raman spectroscopy has been successfully used on the stamps of various countries and periods (e.g. Chaplin et al. 2002, 2004; Najjar 2013; Imperio et al. 2015, Araki et al. 2016, Zhou et al. 2016), including coconut definitives (Lin 2018c, Lin & Lim 2019). A coconut definitive under 532 nm laser irradiation. The laser is generated by a convoluted process full of bombastic chemical formulæ. First a 808 nm laser is produced using aluminium gallium arsenide. The light is aimed at a crystal of a neodymium-doped yttrium compound, which increases the wavelength to 1064 nm. This in turn goes into a crystal of potassium titanyl phosphate oriented in such a way that its anisotropic structure causes the frequency to be halved to 532 nm. There are some difficulties, however. Ink is often a complicated mixture of pigments, dilutants and drying agents (White 1979). Organic inks cannot be precisely identified as they produce broad humped Raman spectra (Araki et al. 2016). The Raman signals can also be overwhelmed by fluorescence; paper coatings (Glazer 2004) don’t help. Many of the coconut definitives seem to present these difficulties, judging from my pilot studies. Higher laser power on the coconut definitives often caused signal saturation due to fluorescence. 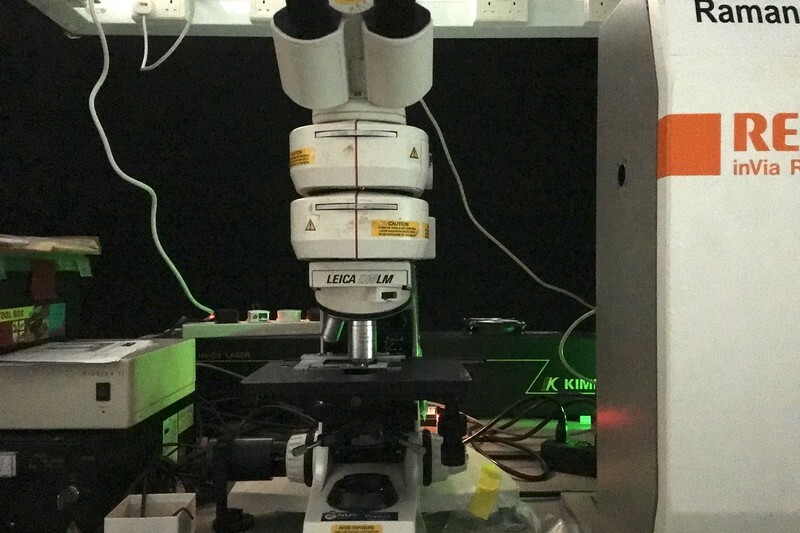 Analyzing the inks of the coconut definitives with a Leica DM LM microscope coupled to a Renishaw inVia Raman spectrometer. I am grateful to Lim Kim Yong, Sow Chorng Haur and the Department of Physics at the National University of Singapore for the facilities and assistance that made my research possible.